May, Mother’s and Valentine’s used to be the only significant national Days in my childhood calendar. (Back then Father’s didn’t need their own Day – pre-feminism it was Mother’s who needed recognition.) Now there is a proliferation of Days in the UK from the worthy, ‘NO SMOKING’ to the silly, ‘National Cleavage’. Rank commercialisation in the US has produced Days for log cabins, sunglasses and chocolate eclairs. Writers now have National Poetry Day and National Short Story Day, and yesterday, 22nd June, was the second national Flash- Fiction Day. This is the story of how author and Creative Writing lecturer, Calum Kerr, turned his love of writing into a national event to celebrate flash-fiction writing and writers. Calum began with a writing challenge – to publish a new flash-fiction every day for a year on a blog. After 100 short stories he wrote a press release (smart promotion), resulting in the coup of his stories – flash365 – being broadcast on iPM on Radio 4 in a Christmas Eve edition. Listen to his stories here, read by Diana Rigg, Rory Kinnear and Emilia Fox. Yesterday, at the Bristol National Flash-Fiction event, (reviewed here) he explained how he’d been inspired by his friend Jo Bell, national Canal Boat Laureate, and formerly Director of National Poetry Day. If Poetry had it’s Day why shouldn’t Flash-Fiction? He checked but there was no National Day for Flash, so he created one. Competitions were created and the stories published in a flash-flood on this website at ten minute intervals. Two anthologies of writing from the Flash-Fiction Days are available – Jawbreaker and Scraps. Yesterday events took place in Shrewsbury, Abergavenny, Bristol and probably many others – all created by volunteers without sponsorship. Calum also took a call from writer in the US who wanted to join in – so maybe next year this could go global. If you want to write and place your flash-fiction here’s a list of web-sites and competitions from the National Flash-Fiction site. After joining in Bristol’s free workshops and evening readings for flash-fiction Day yesterday my conclusion is that a successful writer needs talent and graft to craft their words but must publish, give readings and showcase their work to create opportunities. These days, with blogs, open mics and supportive writers’ groups it’s easier than it was. But, following Calum’s example, self-belief and acting on a bright idea can also achieve great things for writers. Award winning writers, published novelists, creative writing lecturers, competition judges, poets and professional editors gathered in The Lansdown in Clifton, Bristol, to read and celebrate the second National Flash Fiction day. Upstairs at the Bristol event there can’t have been more than 30 people in the room, but there was serious form and talent. Bristol’s Flash events managed the coup of attracting writer and lecturer, Calum Kerr to visit, who founded the day last year. Events took place all over the UK and online flash fiction stories were published at ten minute intervals. The anthology ‘Scraps’ published flash fiction stories too. So what is Flash Fiction? According to Tania Hershman, author of ‘My mother was an upright piano’, and Calum, whose book, ‘Lost Property’ was launched today, there are as many definitions as flash fiction writers. But the writing is short, under 1,000 words. It also has it’s own quirky terminology and categories – a drabble being 100 words and a dribble being 50 words. Lucky, then, that Margaret Drabble doesn’t dabble. Tania and Calum led a free workshop this afternoon in Bristol’s central library which kicked off with an exercise called word cricket where we had to write for twelve minutes. We were given this sentence, ‘It happened precisely at 8:07’ and told to write for 12 minutes with the promise of a word prompts every minute. It was so reassuring – there was no need to make sense – although it seemed everybody’s story did when it was time to read them out. Quickly the room fell silent, with only the sounds of pens pressing down hard on paper. Every minute Tania would call out a word – prompts included the words – purple, impossible, balloon, chicken, sparkling and teapot. ‘purple were the tips of his fingers starting to decay beyond the moon-like fingernails,’ or ‘she hammered on the impossible door’, ‘ iron sparkling against the road’, or ‘chicken stepping’ and, ‘the teapot fell behind her in an Alice in Wonderland moment’. The randomness of the words invigorated my story of being locked in a room with a dead body with no way out. (I know – pure melodrama!). One thing that Callum said resonated with me: ‘A story should have truth in it, even if it’s a lie; it should be a true lie.’ Normally I try and avoid ‘shoulds’ in my life as they are packed with guilt, control and perhaps pain. But it is something I strive for in my writing and whilst editing my novel. I feel an obligation to my characters, I don’t want to sell them short, and without sounding pompous I want my writing to resonate with my readers. I’m drawn to flash fiction as it’s quick, though as I know from my job writing press releases, short pieces are harder and require more skill to write than longer ones. Within the workshop we did a very interesting exercise where we had to edit a piece of deliberately woolly writing supplied by Calum and make it as short as possible. Stripping back the story to its ‘essentials’ is an individual choice though, with no right or wrong way to proceed, which is a useful reminder for any writing group critiquing work. Editing someone else’s work is easier than editing your own work as you can be more objective and are not precious or egoistic about the words. But as I edit this piece of blog writing I find it easier to strike things out following today’s exercise. What’s clear was the huge amount of talent at tonight’s Flash Fiction event with readings from *Anna Britten, Ken Elkes, Kevlin Henney, Tania Hershman, Sarah Hilary, Dan Holloway, Calum Kerr, Pauline Masurel, Paul McVeigh, Nick Parker, Jonathan Pinnock, Clare Reddaway and Deborah Rickard. We’re also lucky to have volunteers such as Kevlin Henney prepared to organise these events. As I sat listening to these stories I was itching to write more, and be part of the crowd on stage sharing my work. “Language is a cracked kettle on which we beat out tunes for bears to dance to, while all the time we long to move the stars to pity. I’m working on a new piece of work – in a genre I’ve only just discovered – video poetry. 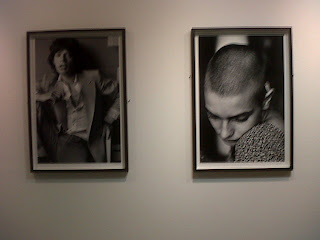 Not the same as a podcast, or just a poet speaking to camera, but the fusion of words and images ( I think!). I was a bit sceptical at first. I mean if you’re a poet don’t you paint with words? Won’t the visual aspect of the film overpower the language? But I’ve found some beautiful examples of words and images working together to create a powerful effect. See http://movingpoems.com/ for some lovely examples of film makers and poets coming together to create something new. I decided to use my traintweets project on twitter. Briefly, at the start of May I set myself the task of writing a line of poetry in 140 characters a day on my daily train commute to work. You can follow me on @wordpoppy or find my tweets by using the hashtag #traintweets. Finally I’ve finished the video – there were lots of technical difficulties – and it took ages to sync the visuals and audio together. Then I wondered if syncing is desirable as the visual will usually overpower the language, and make the language more redundant. But I’m quite pleased with the result. So, here it is. My first videopoem. Please let me know what you think – I’d love to know, especially as I’m entering a competition with this, and this is very much, a first attempt. The modern glass fronted building had a reception line-up that reminded this country hick of the set from Ugly Betty. The women behind the desk were groomed, sleek and responsive with their smiles. A huge flat-screen monitor relayed the news on the wall. 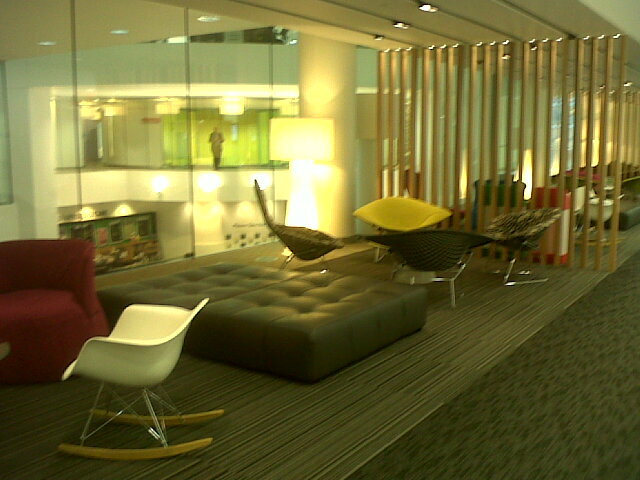 I was invited to ‘sit’ and wait in a lip shaped chair. I fell into it and had some difficulty escaping its open mouth when being ushered away to deposit my coat. The pigs, to my left watched over me as I hung my coat up. Bless them, they’re about the same size as me and have real bristles on their faces. I stroked a synthetic trotter and regretted it as it was squeaky to the touch. 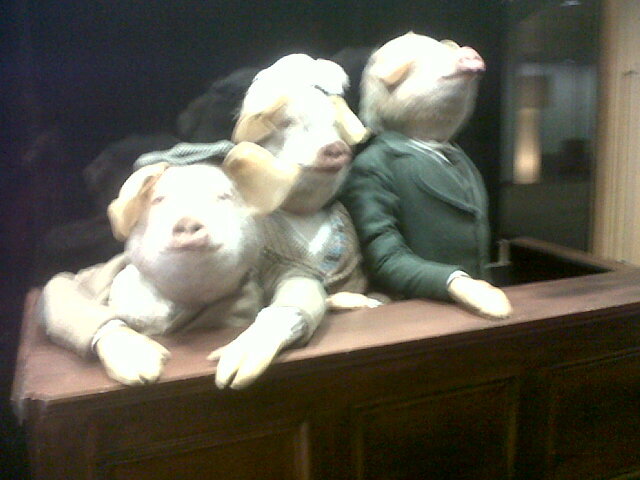 Presumably these pigs began life on Spitting Image. I wish someone would bring that programme back. It so suits the Conservative age. 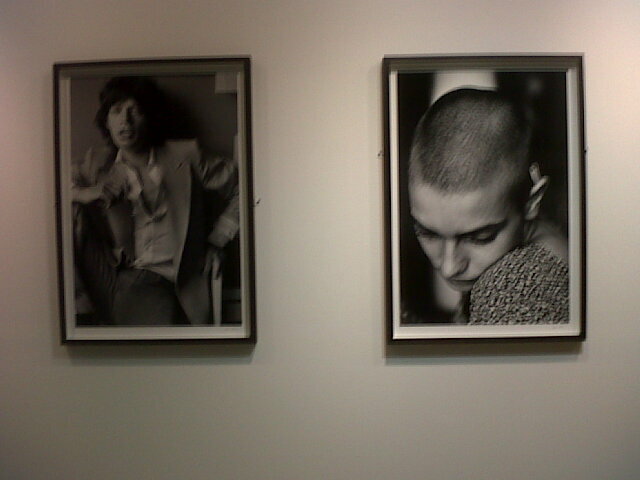 As we walked upstairs we passed portraits on the wall, like these of Jagger and Sinead O Connor, taken by the famous Guardian photographer, Jane Brown. The talk by Chief Sub editor of Time Out, Chris Waywell and the Guardian’s James Callow, was designed to teach freelancers how to avoid obvious mistakes when submitting work. I’m not a freelance writer (yet), but I do work in PR, so it was great to hear from a national publication tips for writers submitting work. I was interested to hear that bloggers sometimes get invited to submit articles. The thing to remember is that it’s a professional relationship and you’re on trial. The key to being asked again to submit an article is to be professional in your writing and dealings with the paper. Rule number one is to understand the publication you’re writing for and to understand the audience of the paper or magazine. Getting the tone right is important. Phone up and get a style guide if you want to impress them. This also applies to writers submitting work to magazines or agents. Don’t send your work to a publication or agent who is not likely to be interested in your genre or subject matter. Research is the key. Never submit late to a publication. You don’t want to be unpopular with the sub editors do you? And you want to write for them again, presumably. If your submission is late that will impact on the chain of people and events at the other end. Word limits: aim to keep to the brief. Submitting under the word limit creates problems as they have to fill the missing space with additional copy, creating extra work. If you submit over the word limit then that can be acceptable as they can cut, but a rule of thumb is to only submit up to 10 % over the agreed word count. Name check, fact check, spell check and carefully proof-read before submitting copy. Let them know of any potential legal issues with your piece. Be concise in your writing and before you click on the send button, check, check and check again. If they change your work, pay attention, analyse those changes and ask yourself why so you can learn from it. A tip for bloggers – it’s easy to self-publish these days, but once your work and words are out there they will be judged, so go through a period of reflection and checking before you post a blog. Make the writing on your blog your best work. I’d highly recommend this Guardian masterclass. The speakers were knowledgeable, friendly and cared deeply about good writing. Chris surprised me by suggesting a technique I’m familiar with for creative writing – when you wake up in the morning write three pages of A4. Doesn’t matter what it is, just write, then when you start work your first words won’t be the first of the day. He also recommended The Artist’s Way by Julia Cameron. Up until a month ago I’d never heard of this book, but this is the third endorsement I’ve had for it. I shall investigate.